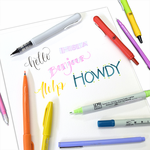 Professional quality dual tip graphic markers, similar to Copic- with permanent, alcohol-based, low odor, Xylene-free refillable ink. Available in a vast array of colors and a colorless blender!! Replacement tips available in 9 sizes- 2mm Calligraphy, 6mm Calligraphy, Fine, Plastic Fine, 2mm Chisel, Broad Chisel, Soft Broad Chisel, Round, and Brush. 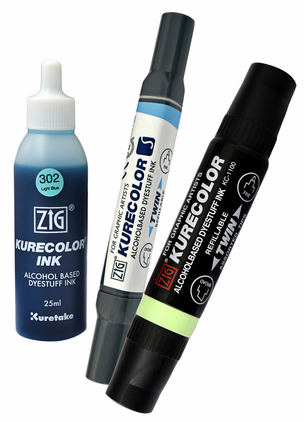 25ml ink refill bottles are available to keep your markers full and happy! Also great for marbling and other alcohol ink art projects.